You won't find oodles of noodles in Thai cooking! Although they do feature, they're less of a presence than in Chinese menus. The most famous and popular Thai noodle dish is Pad Thai, the recipe for which can be found on our Classic Thai Dishes - Main Courses. Noodles or Goi Tiew may be made of egg or rice. Recipes will generally specify which to use, but one of the main features of Thai cooking - and indeed any cooking - is that you use what's fresh, what's available and what you like. 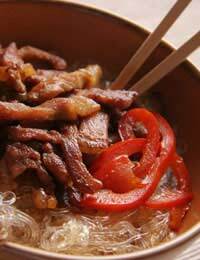 Toss the pork in 1 tablespoon of cornflour and set aside. Roughly cut the pak choi into largeish pieces (2"). Break up and separate the noodles. Place in a bowl with 2 tablespoons dark soy sauce and mix well. Microwave for about 3 minutes or until soft. If you don't have a microwave, heat 4 tablespoons oil in a wok and add the noodles and soy sauce. Stir fry until the noodles are cooked. Set aside the noodles and keep warm. Heat the remaining oil in the wok. Add the garlic and pork. Stir fry until the pork is cooked. Mix the remaining cornflour with the water to a runny paste. Add it to the wok, stirring all the time. Add the light soy sauce, yellow bean sauce and sugar. If the sauce is too thick, add more water. If it's not thick enough, make more cornflour and water paste to thicken it. Add the pak choi. Stir it to heat through then serve immediately with the noodles. Serve with condiments of fish sauce, sugar, black pepper and pickled peppers. To pickle peppers, finely slice some green chillies and marinate in white vinegar. This will keep for days. Don't use the very hot small red chillies. First fry the noodles until crisp. If they're thick, soak first in water for about 15 minutes. After frying, drain and set aside. Heat about ¼ cup oil in a wok. Add the garlic and fry lightly, stirring, for 30 seconds. Add the pork, prawns, yellow bean sauce, vinegar, fish sauce, sugar, and chilli powder. Cook, stirring, until the pork and prawns are cooked. Mix in the lime juice. Add the noodles and mix in well. When heated through, serve, garnished with sliced chilli, grated rind of a lime and chopped spring onions. Traditionally this dish is served with bean sprouts. Now this one's not strictly an authentic Thai recipe but one that uses egg noodles and Thai curry paste. Heat some oil in a wok and stir fry the spring onions, chillies and ginger for about 3 minutes. Add the curry paste and mix well. Add the mange tout and mushrooms and stir fry for 2 minutes. Mix in the pak choi, soy sauce and coriander. Stir until just heated through. Season to taste. Meanwhile have the noodles cooking according to the instructions on the packet. Drain. Serve the vegetables on top of the noodles. If you like extra sauce, mix 4 tablespoons Thai green curry paste with 4 dessertspoons natural yogurt. Mix well and heat gently. Drizzle over the vegetables.